Closed end lease for 2019 Civic Hatchback Continuously Variable Transmission LX (FK7H3KEW) available from April 2, 2019 through April 30, 2019, to well-qualified lessees approved by Honda Financial Services. Not all lessees will qualify. Higher lease rates apply for lessees with lower credit ratings. MSRP $22,370.00 (includes destination, excludes tax, license, title, registration, documentation fees, options, insurance and the like). Actual net capitalized cost $18,055.77. Net capitalized cost includes $595 acquisition fee. Dealer contribution may vary and could affect actual lease payment. Total monthly payments $7,164.00. Option to purchase at lease end $13,198.30. Must take new retail delivery on vehicle from dealer stock by April 30, 2019. Lessee responsible for maintenance, excessive wear/tear and 15¢/mile over 12,000 miles/year for vehicles with MSRP less than $30,000, and 20¢/mile over 12,000 miles/year for vehicles with MSRP of $30,000 or more. See your Honda dealer for complete details. A bold, brash face and LED Daytime Running Lights give onlookers and oncoming traffic an uncompromising view of what’s to come. 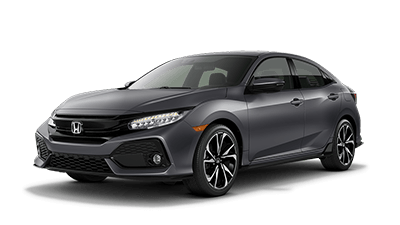 With a piano black grille, black mesh fascia inserts and sharp lines arching across its body, every angle of the 2019 Civic Hatchback exterior is the right angle. The profile shows the 2019 Civic Hatchback is ready to lunge, with every angle and arch pointing forward and its coiled energy just waiting to be released. 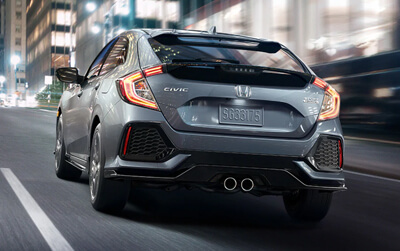 The 2019 Civic Hatchback features a wide stance, distinctive available center-mounted, dual outlet exhaust and a unique rear hatch window so you can better see whatever’s left in your wake. Center-mounted, dual outlet exhaust standard on Sport and Sport Touring. Sport Touring shown in Sonic Gray Pearl. 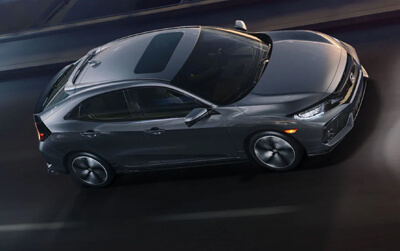 An available one-touch power moonroof ups the driving excitement and fits perfectly amid the sweeping lines that flow over the body of the 2019 Civic Hatchback. One-touch power moonroof standard on EX and above. Sport Touring shown in Sonic Gray Pearl. The aerodynamic design and distinct ridges of these 17-inch alloy wheels help the EX attract attention. 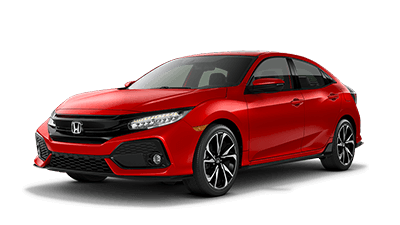 The aggressive 18-inch alloy wheels on the Sport and Sport Touring perfectly complement the design of the 2019 Civic Hatchback. 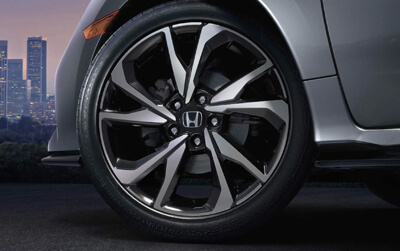 The sporty 18-inch machined-finish alloy wheels are unique to the 2019 Civic Hatchback. Their two-tone machine finish and twisted 5-star design perfectly complement the vehicle’s aggressive looks. Make the exterior of your 2019 Civic Hatchback as unique as you are with Honda Genuine Accessories. There are plenty of ways to individualize your Civic Hatchback. 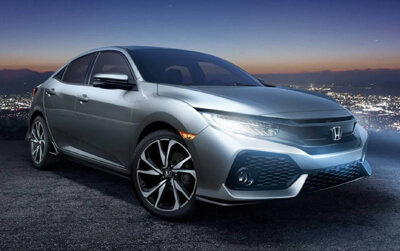 The chrome door trim is a stylish accent that adds a finishing touch to your 2019 Civic Hatchback. 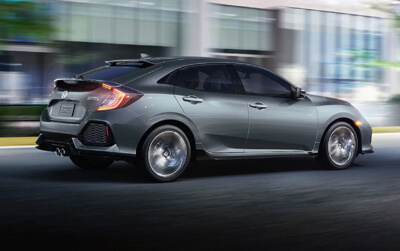 The tailgate spoiler adds a stylish, sporty punctuation mark to the rear of the 2019 Civic Hatchback that leaves a lasting impression on anybody it passes. 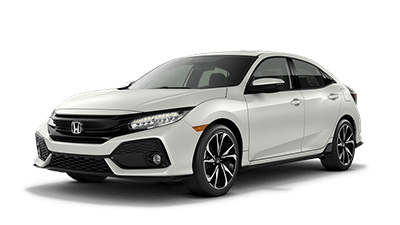 The 2019 Civic Hatchback interior offers two color treatments—black or black/ivory—across different trim levels. Sport Touring shown with Black/Ivory Leather. The futuristic instrument panel features a single-level display that’s easy to read, so you can spend more time watching the scenery fly by. Pulling on a brake lever is a thing of the past. The 2019 Civic Hatchback features an electric parking brake that easily activates with the lift of a finger. 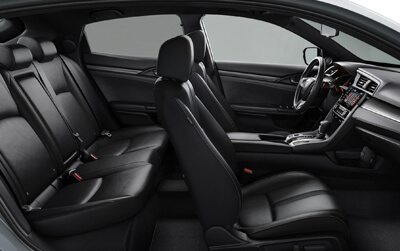 With available leather-trimmed seating and a leather-wrapped steering wheel and shift knob, the cockpit of the 2019 Civic Hatchback is designed for a hands-on driving experience. One-touch power moonroof standard on EX and above. Even if one person wants it hot and another wants it cold, the available dual-zone automatic climate control can make everyone happy and comfortable. Dual-zone automatic climate control standard on EX and above. 2019 Civic Sedan shown. With an ample hatch opening and a 60/40 split fold-down rear seatback that offers multiple configurations, you’ll have plenty of room to pack it all in and head on out. The innovative built-in reversible side-pull cargo cover makes it quick and easy to conceal valuables and keep cargo out of direct sunlight. The 2019 Civic Hatchback has seating for five and all the interior space you’ll need to pile in with your friends—and all their gear—and turn a Sunday drive into something bigger. Interior illumination adds mood lighting and a flash of excitement to the already cutting-edge interior of the cockpit. 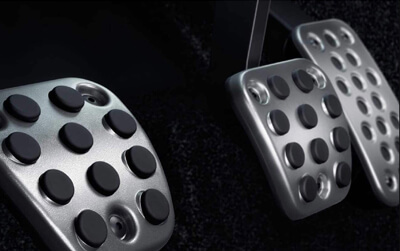 Racing-inspired, textured sport pedals give the Civic Hatchback an extra boost of sporty style. 174-horsepower engine standard on LX, EX and EX-L Navi. Add the available center-mounted, dual outlet exhaust and the already amazing turbocharged engine gains 6 horsepower for a total of 180, giving you a skin-tingling boost. 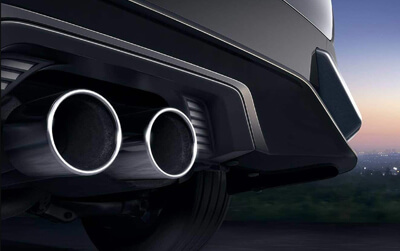 Center-mounted, dual outlet exhaust standard on Sport and Sport Touring. Sport Touring shown. Available paddle shifters allow you to downshift for some extra passing power or shift up on the open highway, all without taking your hands off the wheel. 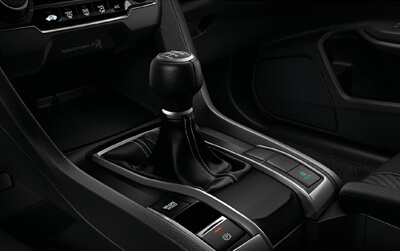 Becoming one with the 2019 Civic Hatchback is easy once you grab the shift knob and row your way through its slick 6-speed manual transmission. 6-speed manual transmission standard on Sport. The 2019 Civic Hatchback is packed with cutting-edge technology offerings and is perfectly primed for leading the charge for the next generation. Honda Satellite Linked Navigation System™ standard on EX-L Navi and Sport Touring. With available remote engine start, you can get the engine running and preheat or precool the interior so the temperature is perfect before you even open the door. Remote engine start standard on EX and above. Honda LaneWatch™ standard on EX and above. A USB Audio Interface comes standard so you can plug in and control your compatible digital devices while also charging them. 1.5-amp USB Smartphone/Audio Interface in front and 1.0-amp USB Audio Interface in center console of EX and above. 1.0-amp USB Audio Interface standard on LX and Sport. 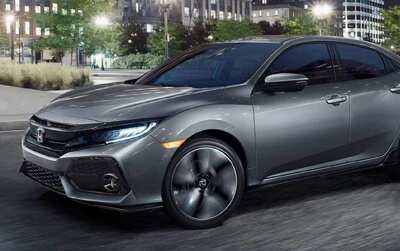 With several choices of audio systems and HondaLink®, the 2019 Civic Hatchback keeps you well connected. HondaLink® standard on EX and above. Tap into your iPhone® and get directions, send or receive messages, and access your music library all through the Display Audio Touchscreen. Apple CarPlay™ integration standard on EX and above. Use your compatible Android™ phone to access directions, text messages, and your music library, all through the Display Audio Touchscreen. Android Auto™ standard on EX and above. Listen to your music, talk shows, audio books and news with available Bluetooth® streaming audio, SiriusXM® Radio, and HD Radio™. SiriusXM® Radio and HD Radio™ standard on EX and above. 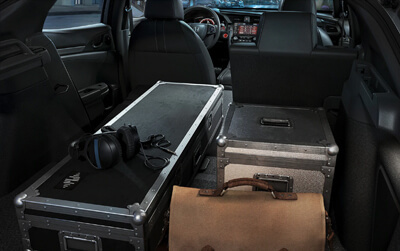 The Civic Hatchback offers three unique audio systems, including an available Civic-first, 540-watt, 12-speaker premium audio system that features a booming 75-watt subwoofer. 540-watt premium audio system standard on Sport Touring. HondaLink® available on EX and above. 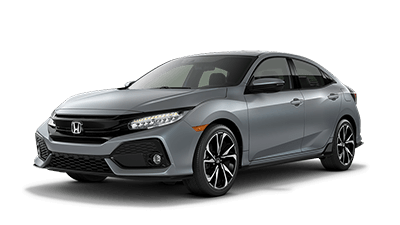 Honda Sensing® comes standard on every 2019 Civic Hatchback. This intelligent suite of safety and driver-assistive technologies, designed to alert you to things you might miss while driving. Adaptive Cruise Control (ACC) with Low-Speed Follow helps you maintain a set following-interval on the highway, so you don't have to manually change your speed. 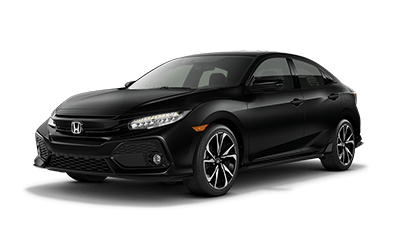 Say hello to the untamed 2019 Honda Civic Hatchback, sporting an athletic style with piano black detailing, a body-colored rear roofline spoiler, and honeycomb panels in the front and rear. Along with a turbocharged engine and astonishing utility, it’s the Civic that’s unafraid to defy boundaries and obliterate expectations. The Civic Hatchback is made for those who love to drive, and appreciate an enhanced level of versatility and comfort along the way. Relax into premium features while innovative technology helps keep you connected through a 7-inch Display Audio touch-screen (EX and above). Every aspect of the Civic Hatchback lends itself to optimal performance. An available Driver Information Interface (DII) highlights all the info you need to drive with confidence and enjoy the journey. Sport models further enhance the driving experience with a manual gear shifter, textured aluminum pedals, and paddle shifters (CVT). 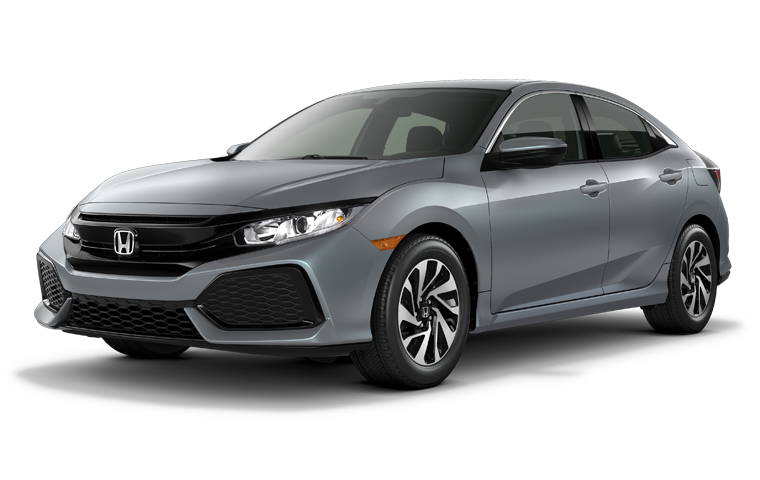 Distinctively intuitive and rebellious by nature, it's the 2019 Civic Hatchback. 29 city/38 highway/33 combined mpg rating for Sport 6MT trim. 31 city/40 highway/34 combined mpg rating for LX, EX & EX-L Navi CVT trims. 30 city/36 highway/32 combined mpg rating for Sport & Sport Touring CVT trims. Based on 2019 EPA mileage ratings. Use for comparison purposes only. Your mileage will vary depending on how you drive and maintain your vehicle, driving conditions and other factors. MSRP excluding tax, license, registration, $920.00 destination charge and options. Dealer sets own prices. Carb emissions: CVT models are LEV3-SULEV30-rated in California and states that have adopted California vehicle emission regulations. CVT models in non-CARB states and 6MT models in all 50 states are LEV3-ULEV125-rated. VSA is not a substitute for safe driving. It cannot correct the vehicle’s course in every situation or compensate for reckless driving. Control of the vehicle always remains with the driver. Always visually confirm that it is safe to drive before backing up; the rearview camera display does not provide complete information about all conditions and objects at the rear of your vehicle. For optimal tire wear and performance, tire pressure should be checked regularly with a gauge. Do not rely solely on the monitor system. Please see your Honda dealer for details. FCW cannot detect all objects ahead and may not detect a given object; accuracy will vary based on weather, speed and other factors. System operation affected by extreme interior heat. FCW does not include a braking function. Driver remains responsible for safely operating vehicle and avoiding collisions. LDW only alerts drivers when lane drift is detected without a turn signal in use. LDW may not detect all lane markings or lane departures; accuracy will vary based on weather, speed and road condition. System operation affected by extreme interior heat. Driver remains responsible for safely operating vehicle and avoiding collisions. CMBS cannot detect all objects ahead and may not detect a given object; accuracy will vary based on weather, speed and other factors. System operation affected by extreme interior heat. System designed to mitigate crash forces. Driver remains responsible for safely operating vehicle and avoiding collisions. Road Departure Mitigation only alerts drivers when lane drift is detected without a turn signal in use and can apply mild steering torque to assist driver in maintaining proper lane position and/or brake pressure to slow the vehicle's departure from a detected lane. RDM may not detect all lane markings or lane departures; accuracy will vary based on weather, speed and road condition. System operation affected by extreme interior heat. Driver remains responsible for safely operating vehicle and avoiding collisions. LKAS only assists driver in maintaining proper lane position when lane markings are identified without a turn signal in use and can only apply mild steering torque to assist. LKAS may not detect all lane markings; accuracy will vary based on weather, speed and road condition. System operation affected by extreme interior heat. Driver remains responsible for safely operating vehicle and avoiding collisions. ACC with Low-Speed Follow cannot detect all objects ahead and may not detect a given object; accuracy will vary based on weather, speed, and other factors. ACC should not be used in heavy traffic, poor weather, or on winding roads. Driver remains responsible for safely operating vehicle and avoiding collisions. Display accuracy will vary based on weather, size of object and speed, and the display may not show all relevant traffic. The display is not a substitute for your own direct visual assessment of traffic conditions before changing lanes. The Bluetooth® word mark and logos are owned by the Bluetooth SIG, Inc., and any use of such marks by Honda Motor Co., Ltd., is under license. The USB interface is used for playback of MP3, WMA or AAC music files from digital audio players and other USB devices, as well as smartphone data transfer on designated Smartphone/Audio Interface ports. Some USB devices and files may not work. Please see your Honda dealer for details. Check the HondaLink® website for smartphone compatibility. Apple CarPlay is a trademark of Apple Inc.  Android and Android Auto are trademarks of Google LLC. SiriusXM services require a subscription after any trial period. If you decide to continue your SiriusXM service at the end of your trial subscription, the plan you choose will automatically renew and bill at then-current rates until you call SiriusXM at 1-866-635-2349 to cancel. See our Customer Agreement for complete terms at www.siriusxm.com. Fees and programming subject to change. XM satellite service is available only to those at least 18 years and older in the 48 contiguous United States and D.C. ©2018 Sirius XMRadio Inc. Sirius, XM and all related marks and logos are trademarks of SiriusXM Radio Inc.  HD Radio™ is a proprietary trademark of iBiquity Digital Corporation. Compatible with select phones with Bluetooth®. Your wireless carrier’s rate plans apply. State or local laws may limit use of texting feature. Only use texting feature when conditions allow you to do so safely. 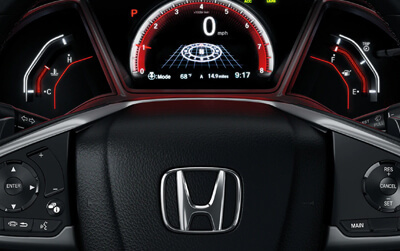 The Honda Satellite-Linked Navigation System™ is standard on EX-L Navi and Sport Touring trims in the United States, Canada and Puerto Rico. (Honda HD Digital Traffic service only available in the United States, except Alaska). Please see your Honda dealer for details.